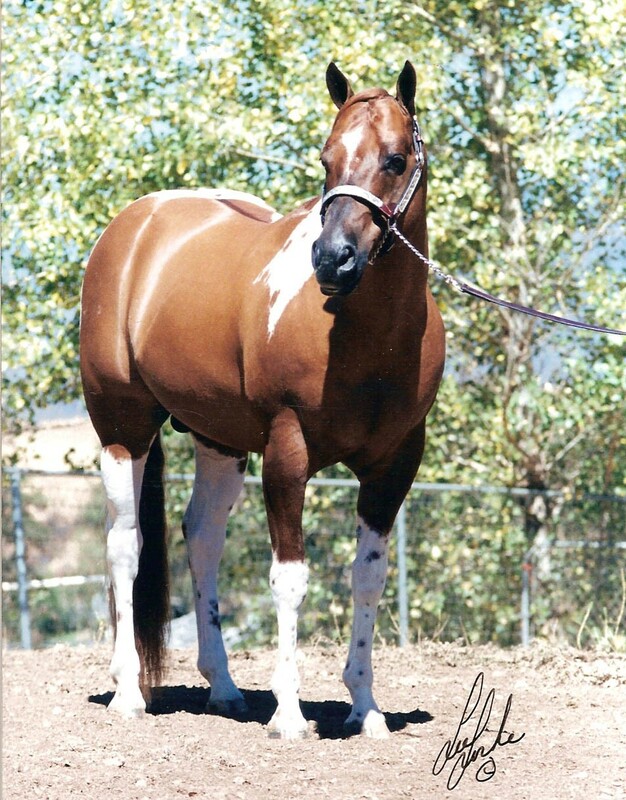 DUN DEAL is a beautiful red dun, APHA/PtHA, 1995 homozygous tobiano stallion. He stands 15.2 hands and weighs in at about 1200 lbs. His PEDIGREE features a quality mix of halter, race, and performance champions. His sire, the late great, Out Foxed Again, CA State Reserve Halter Champion, APHA Points in Halter, sire of APHA CHAMPION, sire of Halter Futurity Winners, Multiple Superior Earners in Western Pleasure, Trail, & Hunter Under Saddle, and ROM Earners in Halter & Longe Line is by Vics Gold Bars, Superior Halter, Superior Western Pleasure, and Superior Hunter Under Saddle and out of Jewel’s Foxy Lady, Points in Halter (by 21 Jewels, ROM Halter by Painted Jewel, APHA ROM Halter & Race and sire of 6 APHA CHAMPIONS, 42 ROMS, 117 Grand Champion Halter). His dam, Sweet Valentine, is by Another Streak, Points in Jumping & Reining (by Skippa Streak, APHA CHAMPION with Superiors in Halter & Western Pleasure and ROMs in Reining, Calf Roping, & Hunter Under Saddle) and out of Snipper’s Susie, (by Snipper Reed, AQHA CHAMPION with points in Halter, Cowhorse, Barrel Racing, Reining, Western Pleasure, Calf Roping, Pole Bending, & Western Riding). Click here to see pedigree. His CONFORMATION speaks for itself. He has a beautiful small head and large round hip. He is balanced and correct with great legs and feet. He is a pretty mover and quite athletic, and so are his babies. His DISPOSITION is sweet, gentle, and willing, and so are his babies. He is HOMOZYGOUS FOR THE TOBIANO PATTERN. 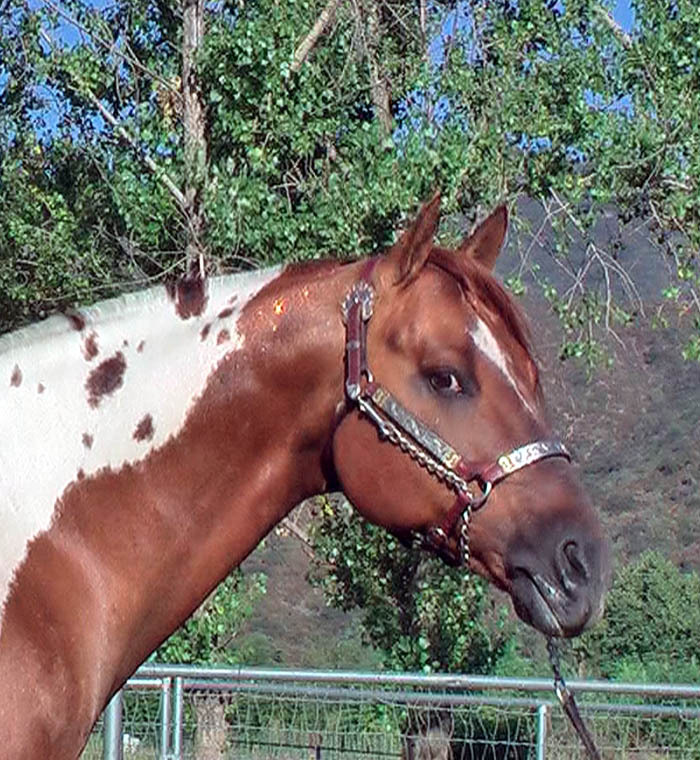 UC Davis tested, he is homozygous for tobiano (BBSS). He will always pass on his tobiano pattern to his babies! 100% guaranteed! He carries the popular DUN FACTOR which brings exciting new colors to the possibilities of colors that your foal may be….in addition to being a tobiano paint horse! For example with the dun factor, black becomes grullo, bay becomes dun, and red becomes red dun. He is OLWS NEGATIVE. UC Davis tested, he does not carry the Overo Lethal White Syndrome gene. For a foal to be born a “lethal white”, he/she needs to inherit the gene from both parents. Dun Deal cannot pass on a gene that he does not have therefore he cannot sire a lethal white foal! He is HYPP N/N. UC Davis tested, he does not possess the disease causing HYPP (Hyperkalemic Periodic Paralysis) gene. He is NEGATIVE FOR 5 DISEASE PANEL: HYPP N/N, Herda N/N, GBED N/N, PSSM1 N/N, and MH N/N. Animal Genetics tested, he is clear (NEGATIVE) of gene mutations for these diseases: Hyperkalemic Periodic Paralysis, Hereditary Equine Regional Dermal Asthenia, Glycogen Branching Enzyme Deficiency, Polysaccharide Storage Myopathy-Type 1, and Malignant Hyperthermia. He is SIRING WINNERS in Halter, Color Halter, Showmanship at Halter, In-Hand Trail, Longe Line, LEADLINE :-), Hunt Seat Equitation, Hunter Under Saddle, Jumping, Gymkhana including (but not limited to) Barrel Racing and Pole Bending, Polo, Trail Challenge, Western Pleasure, Ranch Pleasure, Ranch Sorting, Roping, and now Reining!….and those are only the ones I know about. Dun Deal offspring are also seen in parades, at the beach, and on the trails. DUN DEAL IS ALSO AN APHA CHAMPION SIRE!!!! His son, IM IDEAL, out of Pawnees Miss Millie (by Pawnee Brave), earned his APHA CHAMPIONSHIP in 2014! We are very happy and excited for him and his owner Lenka of Wanted Ranch, Czech Republic!!! It is quite an accomplishment for a horse to earn the title APHA CHAMPION!….definitely a title for a versatile horse who can do very well in halter AND performance! Dun Deal, much like Pawnee Brave, is definitely a sire of beautiful, good minded, athletic, and versatile horses that are succeeding in many different events. The fact that they all have color is just a bonus! Click here to see a detailed list of accomplishments by Dun Deal offspring! Special Low Breeding Fee for 2016: $450 Live Colored Foal Guarantee, Booking fee of $200 is included in the breeding fee. Ranch breeding only. Limited Book. Excellent Mare Care. $10/day dry (mare only) , $15/day wet (mare and foal). Pre-breeding Veterinary exam and current vaccinations/worming required on all mares. Rear shoes must be removed. See our breeding agreement for details. Click on the links below for more information about this incredible stallion! Photo gallery of Dun Deal! Photo gallery of Dun Deal babies! Accomplishments of Dun Deal offspring! DUN DEAL’S 2012 VIDEO SLIDESHOW! Testimonials…what are others saying about Dun Deal! BREEDING AGREEMENT and Breeding Checklist!